Links to additional resources that support action are also provided. 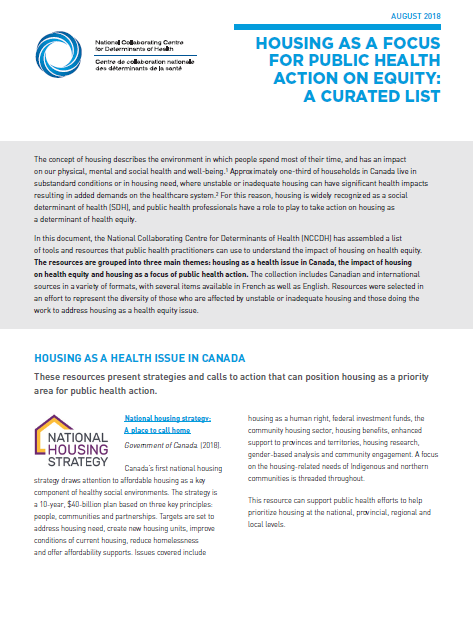 This curated list is not meant to be a comprehensive collection of research that describes how housing is a social determinant of health; instead, the purpose is to point to housing as a focal point for action on population health equity regardless of whether housing is an explicit focus of the public health mandate. National Collaborating Centre for Determinants of Health. (2018). Housing as a Focus for Public Health Action on Equity: A Curated List. National Collaborating Centre for Determinants of Health. Antigonish, NS: St Francis Xavier University.